joanofdark.com: Trek Girl Dress in the wild! Trek Girl Dress in the wild! I have HUGE updates to post! Unfortunately, I also have some looming design deadlines. Had to take a quick break however, and blog this little bit of awesome. 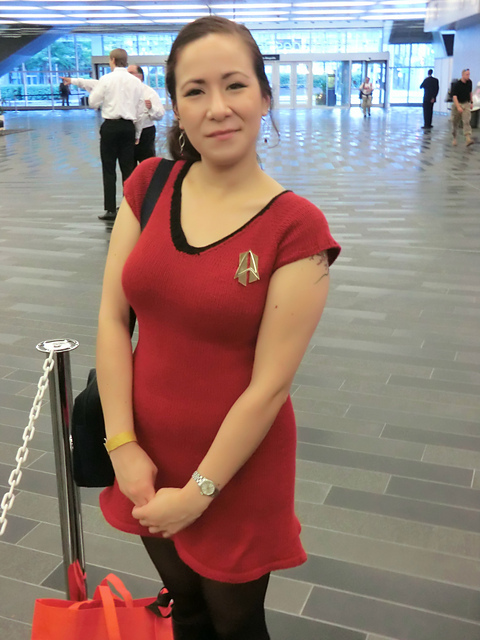 The lovely ChaosGeek on Ravelry knit up a Trek Girl dress for the Montreal Comic Con. That is so awesome. 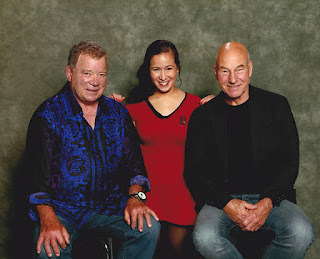 Love the cute dress and even better photo with the guys. Love it! Love the dress!Worried about Jean-Luc's left eye. Has he had a stroke? Or is it a bad angle?